I used to be very confused on which knife to use at which time. After years of preparing food, one of the knives that I find most useful is a fillet knife. While I don’t use my fillet knife every day, It’s a versatile tool that when needed, does the job better than any other knife in my arsenal. I’ve spent a lot of time filleting fish. After using a variety of different knives, I have found that there are bad, good and great knives. For your convenience, I am going to list two of my personal favorites: one manual and one electric. Wusthof makes, in my opinion, the best fillet knife. 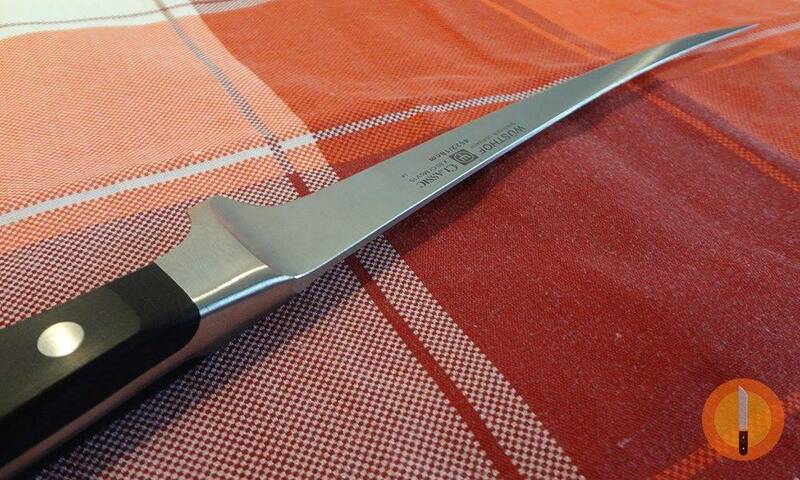 Made from the highest quality metal, this blade simply slices through the skin of meat and glides as you remove it. Wusthof is a German brand, which only adds to the overall appeal of the knife. If you know anything about cutlery, Germany simply produces the top knives in the industry. The manufacturer has made this knife to work with filleting, skinning and deboning. For me, this allows for one knife to do the job of three. As a chef, this makes the preparation process much smoother and saves me a lot of time. Included with this knife is a leather sheath, so if you plan on bringing this knife with you, simply place the knife in the sheath and you’re ready to go. Starting from the spine of the knife, the blade angle tapers. This adds to the knife’s overall sturdiness and provides an exceptional level of strength while not sacrificing the flexibility of the knife. With the handle included, the total length of the knife measures 13 inches. A lifetime warranty is also included. 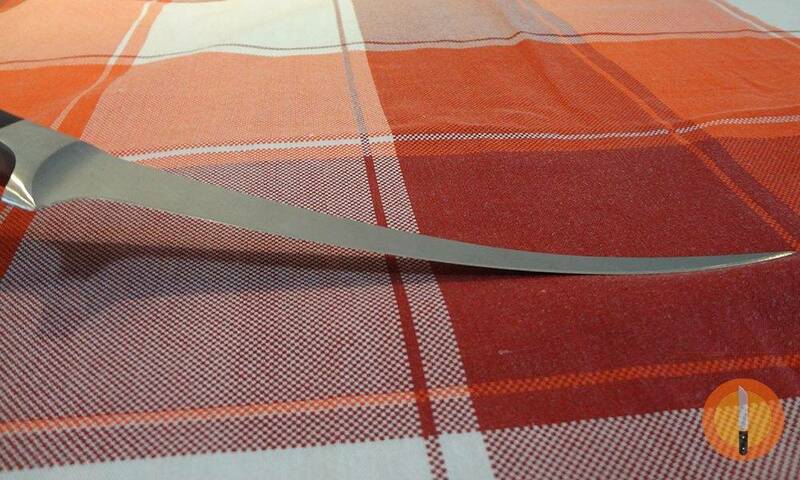 A stain resistant alloy has been put on the blade, so rust or any staining does not occur. Made in the full tang style, the blade run all the way into the handle to allow for better overall control and leverage when filleting. A tempered 58 degree angle is used on the blade, which allows me to slice off the skin without hitting the meat in the process. 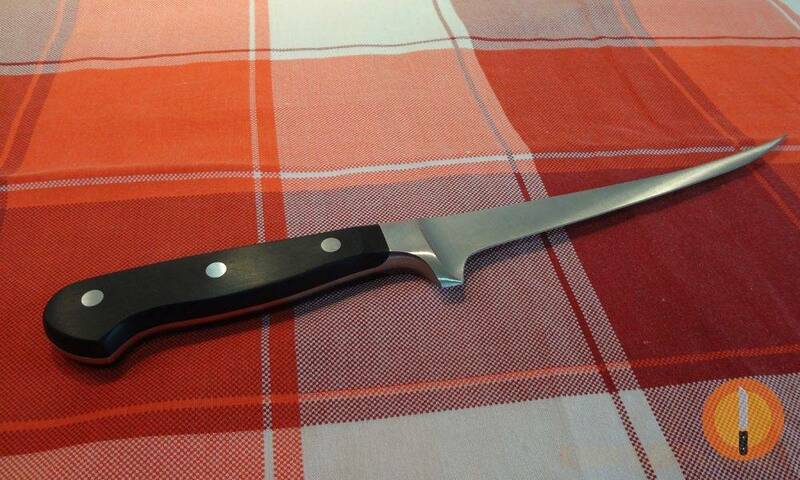 I have personally used this knife to fillet everything from salmon to halibut and more. You’ll want to be very careful when filleting as the knife is extremely sharp. Even the tiniest touch of the blade will leave your hands bleeding. However, you always want your fillet knives to be as sharp as possible, and I’ve yet to find a manual knife that provides this level of sharpness. You really can’t ask for anything more when buying a fillet knife. With German precision, this knife will last for years without needing to be replaced. Some of my friends that use this knife fillet up to 100 fish per month and there is never an issue of dulling or breaking. You can’t find that level of quality with other manual fillet knives on the market. 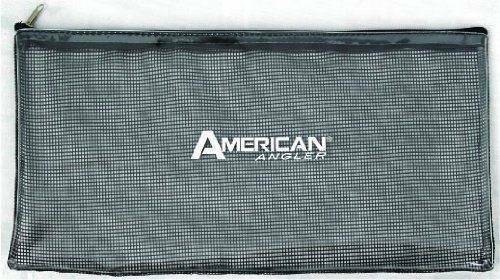 American Angler has an unforgettable name, and the products they produce are just as enticing. The Pro Electric fillet knife is my favorite electric model and comes with everything you need to start filleting in minutes. While unpacking the box, I was shocked at just how small and compact this model was. Once unpacked, I simply attached one of the five blades offered and was ready to start filleting. The handle of the knife is thick and provides a curvature that allows for the utmost in leverage and control. Heavier than a manual knife, this model weighs around 3 pounds, but the ergonomic design ensures that pressure is not put on the wrist. Filleting is near effortless with this model, which is why I use it for most of my bigger saltwater fish fillets. The two 10 and 8 inch blades come in the following: Saltwater, Curved, Heavy Duty Shark blade options. You might not use the shark blades often, but if you ever have a thicker-skin fish and the saltwater blade simply isn’t sufficing, the shark blades will work perfectly. Fast and efficient, you’ll need to spend some time getting used to the way this knife fillets. It took me two tries to really conserve my meat and slice off the skin of catfish with ease. I can fillet, easily, 1 – 2 pounds of fish per minute. If the fish has thinner skin, filleting times will be reduced drastically. This knife quiet, and it gets the job done without leaving a major mess behind in the process. 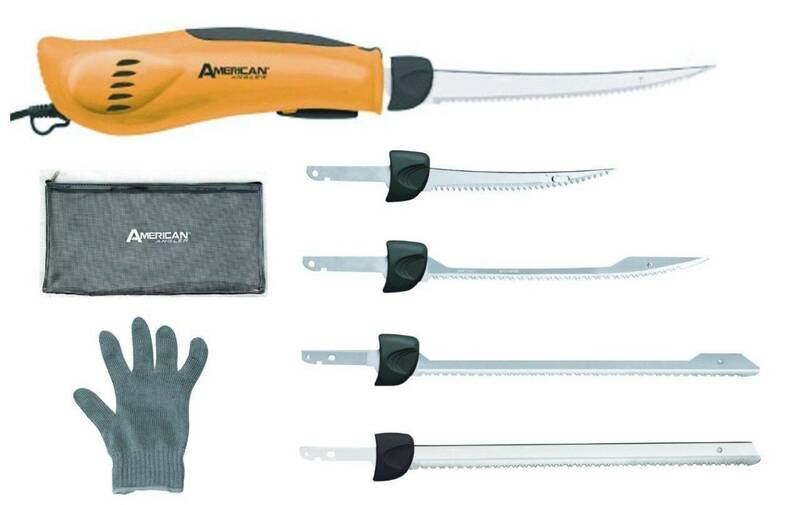 American Angler simply understands the need for a high quality, efficient electric fillet knife. After trying over a dozen other models, this one is my absolute favorite. I have filleted everything from bass to crappie and salmon within minutes. If you’re a fisherman that likes crappie, you can easily fillet 20 fish within 10 minutes. The larger and smaller blade options allow you to have a one-size-fits-all fillet knife that you’ll be able to use for years to come without any issues. Personally, this knife is my go-to electric model and one that I would recommend to my friends and family. Fillet knives are meant to separate the bones from the meat. The better the knife, the easier it will be to remove the bones, and the more meat you’ll have. When cooking, there are a variety of situations and benefits that a fillet knife provides. Be thin enough to lay easily between the meat and bones. Remove the bones with minimal meat loss. There is also a greater ease of maneuvering when using the right fillet knife. With these knives being more bendable than the alternatives, they make filleting much easier. Cleaning a freshly caught fish is also possible with a fillet knife. You just need to pay close attention to the state of the fish. The meat needs to be thawed out and not frozen if you attempt to clean the fish. Otherwise, you may damage the knife or cause injury to yourself. I’ve bought several knives before finding one that I really enjoyed. There are a lot of knives on the market, but the truth is it is more about the blade and size than it is about the brand name. Everyone has their own budget, but before you go out and buy your next knife, let’s examine a few factors that will determine whether your fillet knife is a good choice or not. The standard seen in the industry is stainless steel. As a metal, stainless steel is highly resistant to corrosion and has become the go-to choice for blade makers. The only word of caution that I have with every knife is that you’ll want to read customer reviews and really research the knife and manufacturer. Some manufacturers seem to produce stainless steel that is more brittle than what is seen with a high quality blade. High-carbon steel is also available and is often made with a resistant alloy. The size of the blade is very important. The smaller the blade, the more flexibility it will have. For instance, a larger salmon would require a blade size of 7.5 – 9 inches. If you have a small flounder, you’ll find that a larger blade makes the filleting process very difficult. Most cooks, me included, have a 4 and 7.5 inch knife available. If I had to choose only one knife, I would definitely choose the 7.5” blade. At this size, you’ll find that you can fillet a variety of fish without much of an issue. Personally, I like wood and plastic best. These two handle types are extremely sturdy and get the job done. Rubber is also a good option, but it is all a matter of preference. You’re really looking for a handle that provides a firm grip and great traction. Rubber does provide the best grip overall. Corrosion will not happen with plastic or rubber, but leaving a wooden handle in water can cause the wood to rot. Extra grooves for your fingers is another great option when examining a handle. The flexibility level provided is usually not measured. Since there is no standard measurement, it can be difficult to judge a knife on flexibility alone. I always keep two things in mind when choosing based on flexibility: usage and blade size. The smaller the blade, the more flexible it will be. Electric and manual fillet knives exist. The type you choose really depends on your usage. There are benefits to both of these types that I’ll be discussing below. Great when working with larger fish. I find that I don’t have nearly the same level as control that I have with a manual knife, but the speed of filleting makes an electric model a great choice. Wasting meat will be an issue at first. If you’re used to a manual knife, you’ll need to learn how to conserve meat and properly use an electric knife so that minimal meat is wasted during the filleting process. Manual knives may be more tedious to use, but they work exceptionally well. When using a manual knife, you don’t need to worry about wasting much meat because, as the preparer, you’re in full control. You only need to master the right technique. For the best possible fillet, I recommend manual knives. These knives are also less expensive than their counterparts and can be brought on-the-go without a need for a power source. 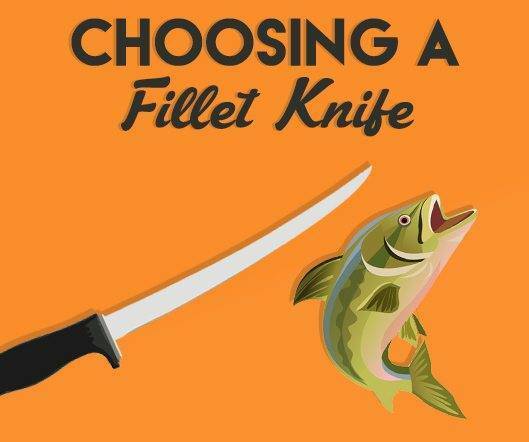 If you plan on filleting fish on your next camping trip, a manual knife makes the most sense. Choosing the right knife for the job is a difficult task. Whether you choose a manual or electric fillet knife, both have their uses and benefits. Manual knives provide the utmost in precision and allow you to fillet and even remove bones from fish if you’re careful. Electric options are the go-to choice if you either fillet fish often, or you fillet bigger fish as they’re faster.